EL PASO — President Trump came to this bustling border city on Monday to rally support for his wall with Mexico. But he was met by El Paso’s favorite son, Beto O’Rourke, who denounced Mr. Trump’s claim that walls reduce violent crime and led the city’s residents in his own boisterous show of opposition. The dueling rallies, just across the Rio Grande from Mexico, offered a vivid snapshot of the national debate over immigration, as well as a tantalizing early glimpse of the rivalry between Mr. Trump and Mr. O’Rourke, the former Texas congressman who is now considering a challenge to the president in 2020. As he mulls a run for the Democratic presidential nomination, Mr. O’Rourke has seized on immigration as a defining issue. With a flair for political theater that even Mr. Trump took note of, Mr. O’Rourke addressed a crowd less than a mile from the El Paso County Coliseum, where the president spoke to thousands of cheering supporters. Mr. Trump’s rally, his first since an acrimonious debate over funding of the wall shut down the government, came as negotiators in Washington appeared to reach a deal, potentially averting another shutdown. The president said he was told about the agreement just before taking the stage. In an interview with Laura Ingraham of Fox News that aired at the end of the rally, Mr. Trump seemed more concerned with talking about the number of supporters in the crowd on Monday night than about an update on negotiations with Congress. The president said he had had the option of receiving a briefing on the negotiations or going on camera. Still, if Mr. Trump wanted to force the debate with Democrats, he could hardly have chosen a better place. The presence of Mr. O’Rourke, who represented the city in Congress before he gave up his House seat to run unsuccessfully for the Senate, guaranteed the president the kind of confrontation he relishes, even if the two men did not come face to face. Mr. Trump has insisted that El Paso was an example of why a wall is necessary. Mr. O’Rourke debunked that claim on Friday in a lengthy post on the website Medium, in which he also tried to set out an alternative blueprint for overhauling the nation’s immigration laws. El Paso’s success, he said, repudiated Mr. Trump’s call for a border wall. “He will promise a wall and will repeat his lies about the dangers that immigrants pose,” Mr. O’Rourke said of the president. Mr. O’Rourke has spotlighted his heavily Latino hometown on Facebook and on other social media sites as an example of what works in immigration policy. A short walk from the coliseum, protesters gathered to march in a show of dissent against the president. Many held signs criticizing Mr. Trump; buttons, signs and stickers proclaiming “Beto 2020” could be seen throughout the crowd. Ms. Harris said Mr. Trump’s efforts to curb immigration was an affront to her son, who crossed the border illegally as a child. Later, he attended high school in El Paso and joined the Army. “My son sacrificed for this country, and this is how he’s treated? How we are treated?” Ms. Harris said in Spanish. Nearby, two El Paso-born brothers, Adam and Andrew Peña, also joined the protest against Mr. Trump. Mr. Trump got the idea to focus on El Paso from an exchange with the Texas attorney general, Ken Paxton, who told him the wall drastically reduced the city’s crime rate and therefore served as a persuasive argument for building one along more of the southwestern border. The El Paso Times, which analyzed three decades of statistics from the F.B.I. and the local police, found that crime peaked in 1993, with more than 6,500 violent crimes recorded. It then dropped by 34 percent over the next 13 years. Local officials, including Mayor Dee Margo, a Republican, have spoken out against Mr. Trump’s claims. Representative Veronica Escobar, a Democrat who recently won Mr. O’Rourke’s former seat, has demanded that the president apologize and meet with migrant families seeking asylum in the United States. Among lawmakers who represent border districts, there is remarkably little support for a wall. Yet Mr. Trump has been undeterred. He repeated grisly stories of violent crimes committed by illegal immigrants — never mind that the crime rate among immigrants is no higher than among native-born residents. 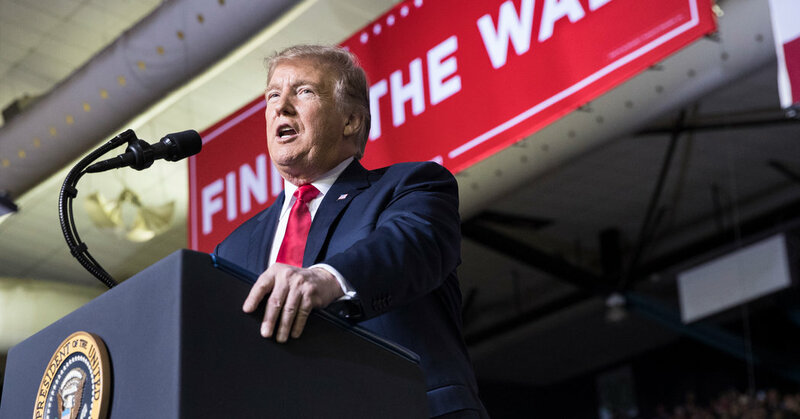 He said a wall would stem the flow of deadly opioids and other illicit drugs into the United States — another dubious assertion, given that most drugs arrive at legal ports of entry. Mr. Trump’s aides are trying to build momentum after last week’s State of the Union address, which they believe was well received by his political base. Unlike some of his predecessors, the president did not immediately leave on a road trip to sell the messages in the address. But he has been eager to return to rallies, which energize him and filled up his calendar before the midterm elections. Mr. Trump dismissed those who disputed his facts about the wall, saying the mayor of El Paso was “full of crap,” even if he was a Republican.